The California community, and fans across the U.S. mourn the life of the 33-year-old rapper, Ermias Davidson Asghedom, better known as Nipsey Hussle, who was shot dead on Sunday, March 31, 2019, outside of his Marathon Clothing store on Slauson and Crenshaw in Los Angeles. Nipsey was one of few rappers that served as an influential role model for black youth and culture, and was a positive voice of reason and prestige across the Crenshaw district in L.A.. But despite Nipsey’s successful rap career and positive influence on black culture, it was his philanthropy, community service, and his economic entrepreneurship in the South Central Area that made him the renowned and famously loved figure he was within the community. Having been raised in three households in the Crenshaw district, his roots were firmly planted in his community. People watched him grow from "thundercat" (a nickname given to him that highlighted his small stature but bellowing voice) to a strong member in the community that carried Crenshaw on his back. For during much of Nipsey's youth, the Crenshaw neighborhood was mainly comprised of predominately low-income black people, gang violence, failing schools, and an overwhelming feeling of hopelessness. In the 90s, gang culture dominated the South Central Area. Inevitably, leaving Nipsey to join the Rollin 60’s Crip gang. The pressure on youth to join gangs are high in urban areas, from gangs pressuring youth, to joining for a sense of "fitting in." He often said “LA is like living in a war zone” and “the people of Los Angeles are suffering from PTSD” in multiple interviews. In 2018, Nipsey told the LA Times "... people die on these blocks and everybody is a little bit immune to it". Like many children raised in the hood and forgotten by the rest of society, Nipsey stressed his desire for someone to care about him and his community when he was young. Nipsey eventually grew to be that person for youth. Even after garnering fame and wealth, the rapper stayed in Crenshaw to invest his success back into his neighborhood, calling it “buying back the block.” Nipsey’s monetary strides towards rebuilding his city included purchasing private and commercial real estate, building a business in the neighborhood, employing neighbors, donating supplies to schools and local houses of worship, fixing parks, and building a STEM program, and center in Los Angeles to bridge the gap between inner cities and Silicon Valley. 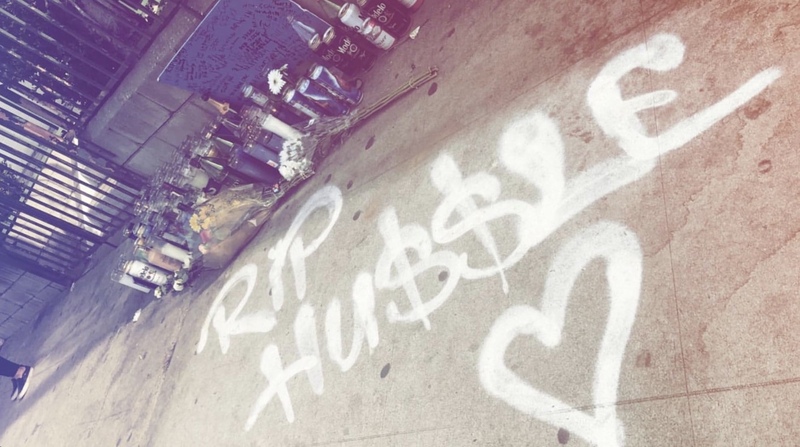 Nipsey was giving people better opportunities and introduced the community to a healthier way of living by filling the streets with positivity. Nipsey's influence was not only strong, but it was much needed and he was a beacon of hope for the neighborhood of Crenshaw. Nipsey Hussle’s STEM (Science, Technology, Engineering, Math) program with Vector 90, Too Big To Fail, was created as an alternative to gang life for children. It provides learning hubs in inner cities for young children to be creative and innovative in a safe place with hopes to push for diversity in the tech community. Nipsey Hussle also invested in refurbishing and reopening World on Wheels, a well-known skating sanctuary in Los Angeles saying, “In middle school, it was the place to be. In L.A., you have to grow up fast, and this was one place kids could go to have a party and be safe”. Since its reopen World on Wheels has been visited by many celebrity friends, including Beyoncé. Nipsey was also an advocate for ending gang violence. While never denouncing or denying his gang affiliations, he often spoke out about the atrocities that occurred while following suit and taking up gang banging like other men in the Crenshaw area in the 90s. In other attempts to unite communities in the greater Los Angeles area and calm gang violence, Nipsey also created music with rapper YG, who has gang affiliation with rival Tree top Bompton. In the late 80's and 90's, gang warfare between Bloods and Crips were heightened, something as simple as wearing the wrong color in the wrong neighborhood could be life threatening. The LA Times reported, In 1992, gang related homicides reached a total of 800 according to a preliminary court by law enforcement officials. The duo provided catchy music with with huge lessons. Some of their songs include FDT (F**K Donald Trump) and Last Time That I Checc’d . Both songs appeal to urban culture with cleverly placed advice and education for young listeners, mentioning topics like voting rights for felons, immigration laws, building black businesses, and investing money smartly. Music videos among the artists highlight both gang colors (blue and red) in an attempt to quell and unite the animosity of gang rivals. Nipsey Hussle was a pillar for the Crenshaw District, creating jobs and educational opportunities to give people in the hood a better opportunity. The city was eternally grateful for his presence expressed by the nightly vigils in front of his store. Visitors told Peacock Plume, The Los Angeles Police Department, the mayor's office, and the Nation of Islam are participating in policing the area to ensure there is no more threat of violence amongst grievers. So many people want to visit the site that there are lines to enter the parking lot every night for the past five days, visitors are allowed 5 to 10 minutes in the Marathon clothing parking lot to express their gratitude. His loss has created an impression of bleak emptiness in South Central and in all of us who adored him. Since his death, Nipsey Hussle's Music Sales have increased 2,776% according to Billboard. His most recent hit "Racks In The Middle ft. Roddy Rich" garnered nearly 3,000 downloads on March 31st. Nipsey Hussle owned all of the rights to his music and encouraged other rappers to follow in his footsteps. 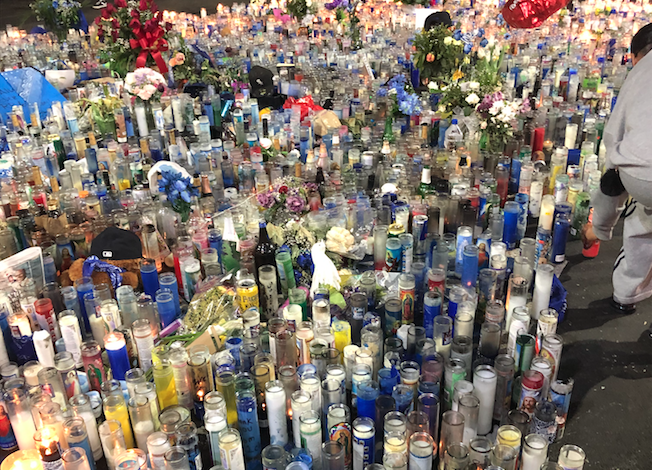 In the very parking lot he sold his first mixtape, met his longtime girlfriend, took his first steps towards rebuilding his community, and where he was gunned down and murdered on March 31, 2019, now sits an array of candles, flowers, stuffed animals, and an entire community grieving. Isala Gray is a writer from the city of Los Angles with a style of writing that is intimate and conversational. She delivers an innovative take on how the elements of fashion and culture intertwine.